It has the ingredients of a conventional holiday – experiencing the culture and hospitality of one of the most exciting cities in the world. But few getaways encourage its participants to pray five times a day or try their hand at fasting, especially when those people are not Muslim. A social enterprise is offering individuals the opportunity to immerse themselves in Islam, without having to convert, through a trip to Istanbul that takes in the regular sights and sounds but also includes prayers at dawn and midnight and lessons on Islam and its basic practices. It draws heavily on the country's Sufi traditions – with a particular emphasis on the poet and mystic Rumi. Ben Bowler, from the Blood Foundation, which runs the project, said: "We wanted to focus on Rumi because he is a unifying figure. 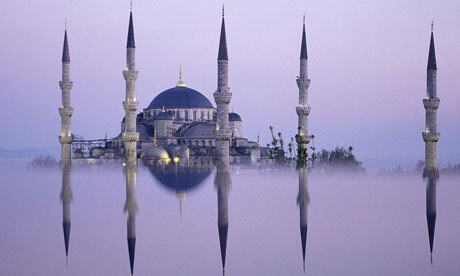 Turkey has a relatively open brand of Islam and Istanbul is an existing tourist destination. "There is a willingness to engage with the west. We might not have found it in the Middle East or parts of south Asia. If we were in Saudi Arabia it would have been harder." The foundation has called the initiative Muslim for a Month, despite it lasting nine days, and wants to offer a 21-day programme in the future. Bowler said most people would find it difficult to take a month off and admitted even the nine-day programme, which offers bed, board, instruction and sightseeing for £600, could have limited appeal.